The following assessment was provided to the Inyo County Board of Supervisors in early 2010. Upon review of this document the Board unanimously voted to allow the Carson and Colorado to proceed with an operational restoration of the #18. The restoration was completed in 2016. Before getting into the actual report, a brief history of the #18 is essential to understanding how the concept of returning the locomotive to operation initially came about. Engine #18 was completed in December 1911 by the Baldwin Locomotive Works and assigned builder’s number 37395. Engine 18—a three-foot gauge (or narrow gauge) locomotive— was built for the Nevada California Oregon Railroad as #12 and weighs in at 89,200 lbs. It has 16″x20″ cylinders and 17,800 lbs. tractive effort (measurement used to determine pulling power). It had an identical twin (NCO #11, builder’s #37394) that was ultimately scrapped by the Oahu Railway and Land Co. in 1946. 20 years of service. Routine maintenance was performed at the narrow gauge shops at Mina, NV, prior to 1938 and at Keeler, CA, thereafter. Engine 18’s final major overhaul occurred in February and March of 1953 at Bakersfield. With the arrival of narrow gauge diesel #1, #18 was officially retired on October 16, 1954. 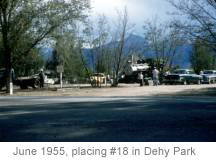 At the request of the citizens of Independence, CA, the SP donated #18 to Inyo County on May 13, 1955 for display. 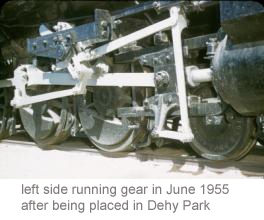 After a final trip to Bakersfield for cosmetic restoration the engine was placed in Dehy Park in June of 1955. 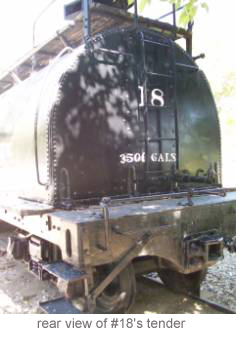 In 1996 Myron Alexander sparked the interest to form the Carson and Colorado Railway Society for the purpose of returning the #18 to operational condition. From 1996 to 2000, with the verbal approval of the County board of supervisors, a good deal of work was performed on the locomotive that will be detailed later in this report. In late 2000, Myron Alexander passed away. 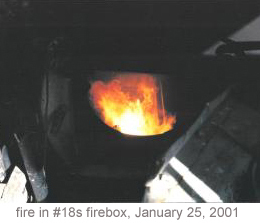 On January 25, 2001, #18 was steamed up to about 50 psi. While minor work has continued, no major work has taken place on the locomotive since 2001; instead the CCRY has been focusing on formulating a plan and mission statement for the ultimate operation and housing of #18. · Why make it operate? · Where will it operate? · Who will take care of it once it’s operational? · Who will finish the restoration? · Is there money to make it operational? · Is it in a condition to easily and successfully make operational? The answer to these questions will be the basis for the remainder if this report. “Why?” is perhaps the most difficult of the questions to answer. Leaving the #18 restoration unfinished does not serve any purpose. The effects of 55 years of display in the elements are visible. The need to remove the #18 from the effects of the elements was the initial motivation for this project, making it the only operating SP narrow-gauge locomotive quickly became an intriguing idea. While the desire of railroad enthusiasts began this endeavor, success will come in making this a viable and desirable project for the entire community. With a population of only 574, Independence is often a town that is passed through by the traveling public. 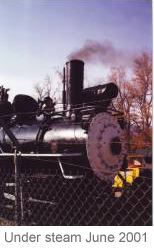 Having an operating steam locomotive could be a significant draw during events such as Mule Days in Bishop or the Lone Pine Film Festival. The opportunity to see the #18 in occasional service would bring additional people to Independence to tour the museum, have lunch, and learn about the county’s history. With the actual restoration of the locomotive being conducted in Dehy Park, it would be highly visible to the traveling public. Having a project of this scale would provide some positive marketing and recognition for the community. Eventually including local students in the operations and maintenance of the locomotive is an idea that has found success elsewhere. The Baltimore and Ohio Railroad Museum set up a restoration facility to maintain their equipment as well teach local youths mechanical skills, such as welding, metalworking and carpentry. With the demise of the SP narrow gauge only a generation or two past, it is likely that many of the local students have a family connection to the railroad and this locomotive. Of the three remaining SPNG locomotives, the #18 is mechanically the best candidate for operation. For a variety of mechanical and historical reasons, this engine is a great choice for restoration and operation. Where will the #18 operate, and who will operate it? It is recommended that the restoration be concluded with the goal of limited service for the community at the Eastern California Museum in Independence. The locomotive could eventually be the centerpiece of a permanent industrial and railroad exhibit at the museum. In addition to providing itself as a classroom for local students, the exhibit could also house some other artifacts currently outdoors on the museum grounds. 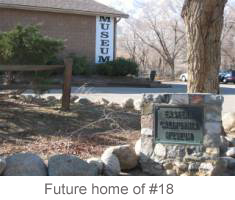 A permanent exhibit would give the #18 a more deserving role in telling the rich history of Independence and Inyo County to future generations. museum it seems only logical to have it with the rest of the museums collection. There are currently other similar projects to look at that have been successfully completed with cooperation from a non profit, a government body and a museum or historical group. Some of the successful groups have been listed at the end of this report. There have also been unsuccessful ventures. To make the restoration of the #18 a success will take everyone involved to have a common end goal. To successfully complete this restoration, the first priority is to have a labor pool that is willing to work consistently over a period of years. The Southern Pacific’s narrow gauge line was in operation until 1960. This late date of operation has created somewhat of a cult following to the line. This following translates into a broad base of interest and possible financial support. For example, the CCRY has been together for fourteen years and its membership base has gone from 3 members to its current 298. That number, along with the membership bases at Laws and in other Southern Pacific Narrow Gauge groups, brings a total dues paying membership to well over 1,000. Because a good portion of that number comes from outside the Owens Valley it is suggested that work weekends be set and advertised in advance so as to attract a larger pool of volunteers. These weekends could include lunches, and possibly a discounted rate at local motels for workers. This concept has proven very successful on other railroad restoration projects. To begin with, about 10-12 weekends a year could be organized. To assist in some of the heavier and dirtier projects, labor from the Inyo County jail could be employed on a limited basis. Between these work dates smaller tasks such as rebuilding appliances could be tackled at off-site locations. In order to best utilize the labor on hand and to keep from repeating work, the following is an outline that can be generally followed. Most of these tasks will be elaborated on later in this report. This is not an all encompassing list of items and many things can occur simultaneously.1. Prepare a location to store locomotive parts as well as tools and hardware required for the work. While the ultimate goal is to have a building erected on the museum grounds, initially a secure shed at the park for tools and the boxcar at the museum for plumbing and parts should suffice. 2. Remove the tender from the park to the museum grounds. 3. Remove locomotive jacketing, plumbing, appliances and running boards in preparation for ultrasound testing. 6. Graph out boiler and begin ultrasound testing. 7. Begin necessary boiler work. 8. Remove brake rigging, valve motion, side rods for driver removal. 9. Remove spring rigging, drivers and pony truck. 10. Clean and renew running gear components, where needed. 12. Reinstall drivers, pony truck and spring rigging. 13. Reinstall valve motion, side rods and brake rigging. 14. 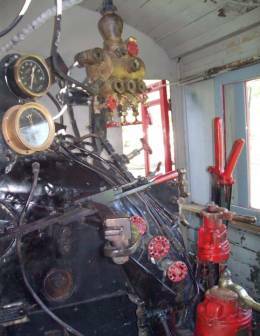 Move entire locomotive to museum once running gear is reinstalled. 15. Rebuild all appliances and accessories. 17. Replace all tender and cab wood. 18. Clean and repair all plumbing. 19. Replace rebuilt tender trucks. 20. Begin tube installation once locomotive is generally reassembled. 21. Finish all boiler work and complete with hydro and steam test. 23. Reinstall running boards, plumbing and appliances. 24. Set valve timing of locomotive. 25. Finish all cosmetic items, including painting. 26. Steam up and test all functions. While many of these items sound simple, most are rather time consuming and can be difficult, especially in a park setting. The most critical part of the entire restoration will be when the engine is disassembled as far down as it is destined to be. It is critical to have the patience and funding to not allow the project to die at this time. A restoration of this size based on the outline and work schedule suggested above will likely take 5-6 years to complete. As the locomotive begins to be reassembled and more tasks are completed, the enthusiasm will hopefully grow and the work should progress more quickly. One concern in a project of this magnitude is how to protect the asset, the municipality and the project itself from a loss of interest or some unforeseen change of circumstances that brings work to a halt. While the insurance policy of the CCRY should cover all members who take part in the restoration, it does not protect the project from being left unfinished. Providing assurance to Inyo County that the project will be completed could come by implementing a contingency fund that would be sufficient to take care of any cosmetic repairs and reassembly. These funds would be supplied by the CCRY, held in an escrow account, and returned to the organization upon successful completion of the project. In the event that no progress was made over a designated period of time, the supervisors could use the money to make any cosmetic repairs necessary. In taking in the overall scope of this project it needs to be remembered that the locomotive will not be completely disassembled into a pile of parts during the restoration but will have many individual pieces removed, repaired and reassembled as the project goes along. As has been the case to this point, most work will not be very noticeable, although some aspects will be very obvious such as moving and rebuilding the tender as well as removing the drivers. To keep the project in the community’s and general public’s eyes it would be beneficial to have a frequently updated website that outlines the progress. Additionally the occasional open house could be held to give a hands-on look at what has and will still need to be done. Quarterly updates to the County Board of Supervisors could also be provided. 1. Private donations: Usually there are many $20-100 donations with a handful of large $1,000-plus donations. The difficulty in securing the large private donations is that the donor often wants assurances that the project is on a path to success. It’s hard to get or ask for $10,000 when there is nothing readily apparent to show for it. Money from membership dues and hat/t-shirt sales would also be in this category. 2. Public grants: This route was explored and actually secured by the CCRY, but because of state budget woes and an inability to bring all the pieces together in a timely manner, the grant was deprogrammed. In the short term, this is an unlikely option. However, once the project is under way, grants could be pursued for a structure to house the engine or for more defined parts of the restoration. 3. Private grants: These grants can come from a number of sources related to railroads. 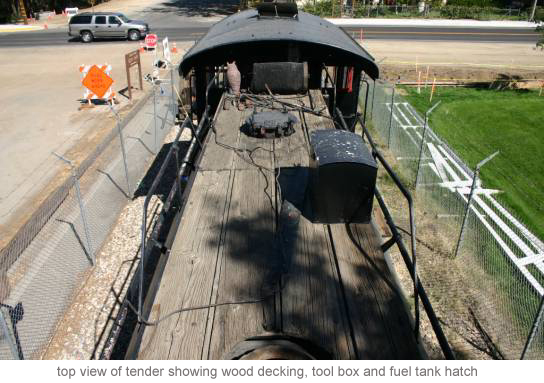 The Southern Pacific Narrow Gauge Historical Society and the Southern Pacific Historical and Technical Society both have funds available for projects like this. Trains Magazine offers a $10,000 annual gift. This often times goes to steam locomotive projects. These are a few example of where private grant moneys can come from. 4. Fundraisers: Fundraisers can take a variety of forms for a project like this. The sale of some of the group’s unwanted assets could be an easy way to generate some money. Other groups have succeeded in having members buy individual parts for the engine, items such as tubes and staybolt caps are easy to sponsor. Selling pieces of the old tubes or the old caps could also be explored. More often than not similar projects are begun with only a portion of the required funds in hand. That is the case with this project as well. This does not translate to doing the project on credit, but rather doing the restoration like a highway project in which money is appropriated for different phases of a total project over the course of a few years. Often times the progress of the project is what leads to additional funding. In an effort to satisfy both Inyo County and the CCRY, an agreement could be made that the restoration will not continue in earnest without one third of the estimated total funds required in hand. In return, the county would give the CCRY a long term lease of the locomotive with assurances that the engine can be operated and housed at the Eastern California Museum. To date, the lack of any firm agreement with the county has been the CCRY’s single biggest challenge in trying to secure funding and continue the restoration. The most critical and costly area of any restoration is the boiler. The #18’s boiler is the original 1911 Baldwin boiler. It operated at 180 psi with the Cole safety valves set to open at 200 and 205 psi respectively. 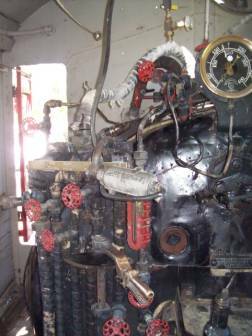 As detailed below, many aspects of the boiler-including the crown sheet, over half the stay bolts, the lower side sheets and the tubes-all were replaced at a late date in the engine’s service life. Although no records were located, based on the visible wear, it is likely that this work was performed during February and March of 1953. For anyone operating steam locomotives today, the most important safety standards are established by the Federal Railroad Administration. In 2001, the FRA revised Part 230 of the Code of Federal Regulations, which pertains to steam locomotives. The Form 4 work mandated within Part 230 deals specifically with the boiler and is considered a “birth certificate” for a steam locomotive. While any operation of the #18 that occurs at the Eastern California Museum would not be under the direct jurisdiction of the FRA, Part 230 was written specifically for projects involving historic equipment that contain a large volunteer work force and are intended for occasional operation. Part 230 was written with safety as the primary factor. One of the requirements of the Form 4 is to do thickness testing on all surfaces of the boiler. Thickness tests were performed on many areas of the boiler barrel in 1997, but the records of the testing have been lost. A proper ultra-sound test will require all of the lagging to be removed as well as all appliances and fixtures that obscure points on the boiler. The original asbestos lagging was removed in 1996, when the boiler barrel was cleaned and a new jacket made. A new type of insulation was put in place in 2001, but is not ideal for steam locomotive use and should be replaced with a block type of lagging. 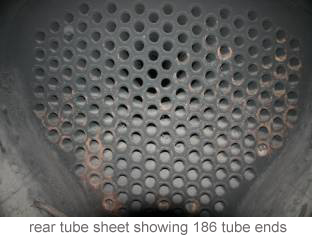 The #18’s boiler has 186 2” tubes, with four tube holes in the smokebox tube sheet plugged (this was not uncommon on steam locomotives). The tubes are approximately 11’8” in length and have a total heating surface of 11,465 sq. ft. During the original hydro test in which the boiler was filled with water and pressurized to 205 psi, all but two of those tubes were found to be dry. The two leaking tubes were both replaced and none were found to leak during the 2001 steam test. The current tubes were installed in February 1953. Both front and rear tube sheets are ½” thick and appear in good shape. The interior inspection of the boiler revealed very minimal use on the water side of the tubes. Regardless of their condition, all tubes will have to be removed and replaced to comply with the Form 4 requirements. This task can be accomplished by mostly volunteer labor under the supervision of a skilled individual. 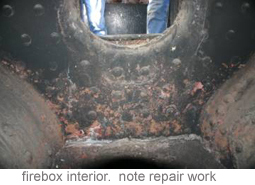 A certified welder will be required to seal-weld all the tubes on the firebox side of the boiler. The interior inspection found all aspects of the boiler to be in excellent shape. The barrel has 5/8” thick material. All surfaces and seams, as well as braces, appear to be in excellent shape. Minimal scale (the build-up of water-born impurities on metal) is present in all these areas. The dry pipe also appears to be in very good condition. The entire crown sheet (the critical surface above the fire) was replaced at a very late date in the engine’s service life and there is no visible pitting anywhere on it. Ten rows of flexible crown staybolts, which hold the crown sheet in place, were also replaced and show no sign of wear and have minimal scale on them. There are three fusible plugs located on the crown sheet. The lower side sheets on both sides of the keyhole firebox have also been replaced late in the engine’s service life. There is also evidence of firebox door sheet work. All staybolts related to these areas have also been renewed. 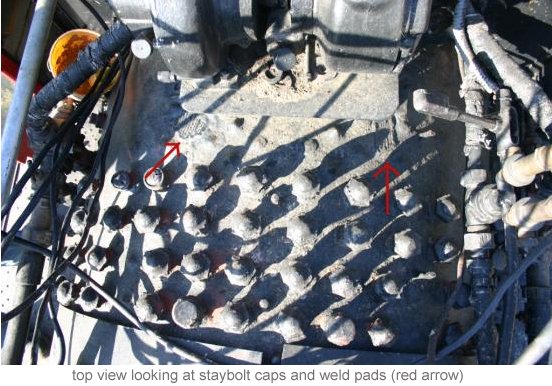 Based on an a visual estimate, it appears that approximately 50 percent of the locomotive’s staybolts of either rigid or flexible styles were replace within the engine’s final couple years of service. While both rigid and flexible staybolts have all been drilled in the locomotives operating days, the drill holes will require cleaning. The one area of the boiler that does show signs of wear and age is the firebox wrapper sheet and flexible staybolt caps. There are approximately 170-180 caps of both “A” and “WR” styles. All caps will need replacing. Of that number, a visual inspection shows that approximately half of the sleeves will need replacement as well. The wrapper sheet itself was 9/16” thick when new and has developed a few areas of pitting near the front of the cab. These areas were discovered during the 1997 ultra-sound test. A local volunteer and certified pressure vessel welder by the name of Tim Conners was brought in to pad weld these three areas. The welding appears to be of acceptable quality, but will need to be more thoroughly inspected. Finally, the #18 currently has only one water glass to determine the water level in the boiler. To meet the Part 230 requirements, a second Nathan reflex glass has been obtained, but will require proper installation. The interior of the smoke box has been kept fairly clean over the years. The liner on the lower half of the smoke box does show signs of significant wear and could be replaced. For now, the replacement of it is just a suggestion. In 1997, the pipe that delivers steam to the right cylinder was removed, two mounting ears were repaired and the pipe was then reinstalled. While an excellent repair job was done, the seats were not lapped in prior to reinstalling. The left side will need the same type of repair and both sides will need to be seated in properly. The engine’s petticoat pipe at the base of the smoke stack is in fairly good condition and should only require some minor repairs and remounting. The #18 was designed to burn fuel oil. Therefore it has firebrick as opposed to grates inside the firebox. The firebrick in the #18 was completely replaced in 1997. Unfortunately it will have to be removed to ultra-sound the side sheets. 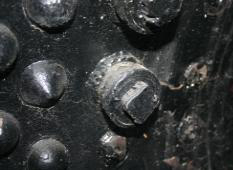 The snakehead, which is the opening that allows fuel to enter the firebox, was found to be extremely plugged up when the engine was steamed up in 2001. It will require a complete cleaning. It also would be wise to inspect and clean out or replace the fuel line and atomizer plumbing. 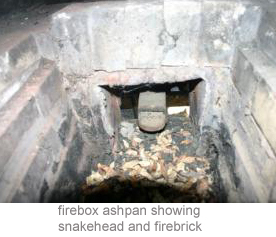 The ash pan and damper appear to be in relatively good condition, however once the firebrick is removed a thorough inspection of it should be performed. Where it mounts to the frame is where most fatigue occurs. In 1997 some major repair work was done on the ash pan by Russell Flemming, but a full ash pan rebuild does not seem necessary at this time. With any locomotive that has spent 55 years sitting outdoors in a park, the running gear is usually a big source of concern and expense. In February and March of 1953, #18 was at the SP’s Bakersfield shops for a complete running gear overhaul. Based on the normal train schedules and available motive power between April 1953 and October 1954, #18 likely accrued approximately 10,000 miles after its overhaul. The current wear on the running gear exhibits a locomotive with little hard use and many more available miles. Because of the dry climate and good care taken in displaying the locomotive, much of the work done during 1953 is still in very acceptable shape. Removal of the left front grease cellar showed that the journal surface was without rust and the grease was still pliable. The remaining five journal surfaces did not show signs of rust either. However, removal of the right front pony truck oil cellar revealed rust on the journal surface. There is rust on the other three pony truck journals as well. This is likely attributable to their utilizing oil rather than grease as well as to the more exposed nature of the pony truck. 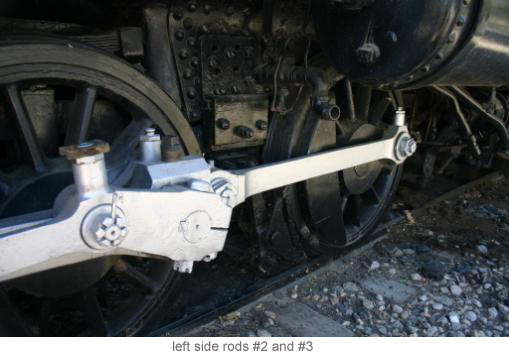 None of the locomotive axles appear close being condemned because of wear. The right front crown brass is the thinnest of any of the six brasses and it is well within usable specs. 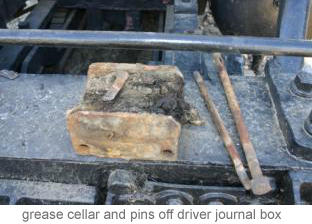 All wheels and journal boxes should be removed for a full cleaning and inspection. Unless any excessive grooving, unnoticed wear or cracks are located upon disassembly, it does not appear any crown brasses or axles will need replacing. All of the journal surfaces will require polishing and possible truing. The wheel profiles on the six drivers show little wear. No re-contouring should be required. 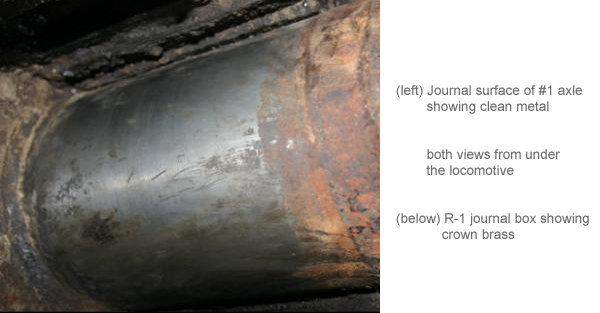 The right front pony truck flange does show signs of wear likely caused by being out of tram or else the pony truck itself is not tracking properly. The right front flange is not yet at a limit to be condemned. For the intended use of the #18 it should last for many years. The locomotive will need to be trammed upon reinstalling of the drivers. In 1996-97 at least the right side rods were removed and greased with soft grease. At that time no rust or excessive wear was found by those involved. While the side rods were not removed for this report, no excessive lateral movement could be found. 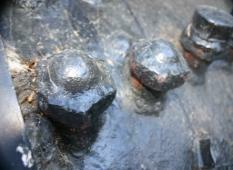 All side rods should be removed during restoration and it could be expected that some rod brasses will need replacing. All of the side rods are currently painted and will need to be stripped and polished to comply with federal regulations. 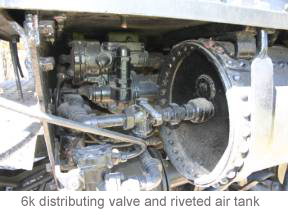 Valve motion (the means in which the engineer controls the direction of the locomotive) was found to be without any noticeable wear in any aspect of its construction. The Johnson bar, which controls the valve motion, is able to be put in any notch on the quadrant with relative ease. The valve rod packing is currently missing, although new packing was supposedly purchased. All the valve motion should be removed for cleaning and inspection as well as stripping and polishing. The engine timing should be re-checked upon reinstalling. Both pistons were removed during the 1996-99 work, allowing the rings to be examined and the piston rods to be polished. During the current evaluation, the left cylinder head was removed. 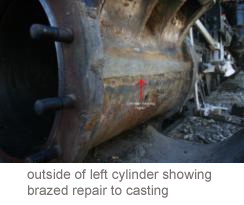 A large crack that had developed at some point during its operating existence was found to have been brazed and the cylinder subsequently bored out by the Southern Pacific. 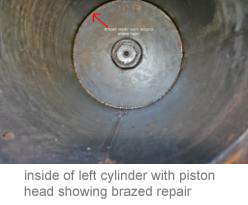 The piston head also shows signs of brazing. All of this work was done with a level of skill and craftsmanship that should last during any future operations. All of the piston rings appear to be in very good condition and have little slop in them. Both piston and valve rods could be hard chromed to prevent future rusting and provide longer packing life. All packing will need to be replaced. The locomotive’s springs and equalization appear without significant wear. No broken spring leafs could be located. The engine’s weight seems well distributed with the lone exception of, possibly, the pony truck. When the spring rigging is taken apart for driver work, a close examination should be conducted of all its components. It is possible that some new bushing or pins will need to be made. Should any extensive operations be planned in the future, a spare spring of each style should be acquired. Brake rigging is normally an area of excessive wear. Because of the relatively flat nature of the Owens Valley the overall rigging is in remarkably good condition. 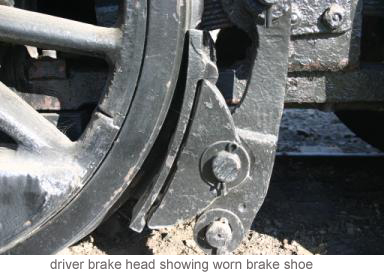 The brake shoes, however, have been well used. All the driver brake shoes should be replaced and some spares made. As always all of the brake rods and pins should be thoroughly inspected. In all, the running gear is in above average condition. While most all aspects are very usable, all components should be disassembled, inspected and cleaned. For the limited level of operation suggested for this locomotive, the running gear should have a life span exceeding that of most of the group’s members. ·Air Compressor (for engine brakes): Westinghouse single stage 9 ½” pump. The pump was removed in 1999 and disassembled, cleaned and fitted with new top and bottom gaskets. When tested under steam at 125 psi, the pump would cycle once and stop. Once it is removed for boiler work, the pump should be examined again. The pump appears in relatively good condition, but will certainly need minor repair. 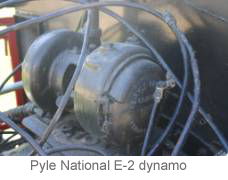 ·Dynamo (for electricity): Pyle E2. It was tested on air in 1997 and produced 32 volts. A thorough cleaning and servicing will be in order. ·Hydrostatic Lubricator (for piston and compressor lubrication): Edna #9 three-feed. The lubricator was completely gone through in 1999 and had some sight glasses and all gaskets replaced. While untested, it should be in ready-to-use condition and not need additional work. ·Whistle and bell: The Nathan 5 chime whistle was gone through in 2009 and should be ready for service. The bell is equipped with a pneumatic ringer that will need rebuilding. 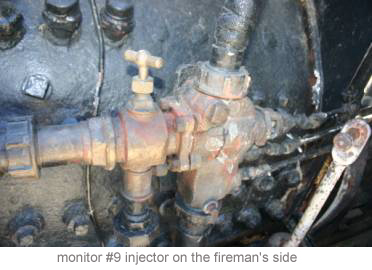 ·Injectors (for adding water to the boiler): Monitor #9’s. Both were gone through and cleaned in 1998 although neither was tested. Because of the critical need of putting water in the boiler, these should both be inspected by someone who is familiar with them and their workings. reinstalled gauges and applianceswindow frames will need replacing or repairing. All new safety glass was installed in the old frames in 2003. With the exception of one piece that was broken, all should be reusable in new frames. The interior woodworking will need replacement, including side panels, interior roof, and window sills. New seats and arm rests will need fabrication. All electrical wiring will need replacement. However, all other components—including both front and rear headlights, classification lamps and all cab light housings—are all in place and in good condition. With most restorations of this size, the plumbing often gets removed early on to access the boiler underneath. It is tossed in a pile and then gets reinstalled years later. The key to making reinstallation easy and cheap is to clearly and consistently mark and document where each piece came from and have a place to store it out of the way. During the early years of work on the engine, most of the plumbing located on the boiler was removed and stacked. During 2008 much of this was re-identified and placed back in its proper location. One of the first tasks of the restoration should be to properly document and mark the plumbing and brackets and organize them in to groups. The former SP boxcar located at the museum would be an ideal location to store all items not immediately needed. 1. Anything that was used for water will likely have rust in it. The water lines are usually good candidates for replacement, although a simple hydrostatic test of the piece and cleaning may be all that is necessary. 2. The valves on the locomotive are likely of a better quality than what is readily available today. Cleaning, new packing and lapping should save most of the originals. 3. Air lines will usually be good, but they will have a tendency to readily leak at joints. While one leak is not normally detrimental, they will accumulate quickly and become a headache. In some cases, replacing this plumbing is easier and cheaper than salvaging the original. Air lines often have rubber gaskets in unions that will need replacement. was at some point split and was re-welded. This line should also be replaced. The steam heat line for the oil tank has also been found to leak. The #18 is equipped with a 6ET air brake system. As mentioned above, the plumbing will need to be looked at and, in some cases, replaced. The brake system includes an H-6 automatic brake valve, and S-6 independent brake valve, two B-3 feed valves (designed to regulate the air pressure), an S-type governor and a 6K distributing valve. All of these can be readily rebuilt by one of a number of companies. The B-3 feed valves, however, are an older, more cantankerous style and it may be worth considering acquiring some C-8 feed valves to replace them. Both B-3 valves were tested on a test stand in 2000 and proved to be non-operational. The main air reservoirs are 7ft. long and 18in. in diameter and are riveted. Because riveted air tanks are now illegal both will need to be replaced with new drill-tested ones. The equalizing reservoir appears good. The locomotive is equipped with two 10” diameter brake cylinders that will need new cups and greasing. The #18 has a semi-cylindrical whale-back style tender. The tender has a light weight of 34,700 lbs, a water capacity of 3,446 gallons and an oil capacity of 1,529 gallons. The tender has an all steel frame and measures 26’ 11” in length. During the early years of restoration, the water side was completely cleaned out. It has been filled with about 800 gallons and shows no signs of leakage. A more thorough cleaning and possibly a coating of sealer may be required. All of the water valves should be lapped and inspected. New tank leg hoses will also be required. The oil tank was found to contain a thin layer of the locomotive’s original fuel, bunker C oil, that was petrified. Due to safety concerns it was never cleaned. Approximately 100 gallons of a kerosene/diesel mixture was put into the fuel tank for the 2001 steam-up, what was not used then has probably broken loose the older oil. The tank should be thoroughly cleaned out, probably by professionals trained to do such work in confined spaces. The fuel lines will also need cleaning and inspecting. Wood decking surrounds the tank and is also on top of the tank. All of this should be replaced with like materials. 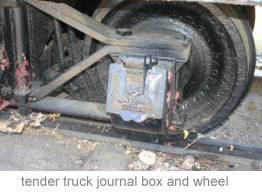 The tender trucks were made by Simplex and have 4 ¼ x 8” journals. None of the journal surfaces show any signs of rust. The trucks, however, do have wood spring planks that are in need of replacement. The trucks will require disassembly to replace the spring planks and should be fully cleaned and inspected while apart. All brake piping should be inspected for leaks and the brake cylinder cup replaced. The backup headlight is missing its glass along with its wiring and will need attention. Finally, as is the case with the locomotive the tender is also missing its ¾ size coupler. In general the tender is in remarkably good shape and could be a good starting point for restoration. As far as the physical condition of the locomotive and the desire of those leading the restoration effort, there is no question that this can be a successfully completed project. 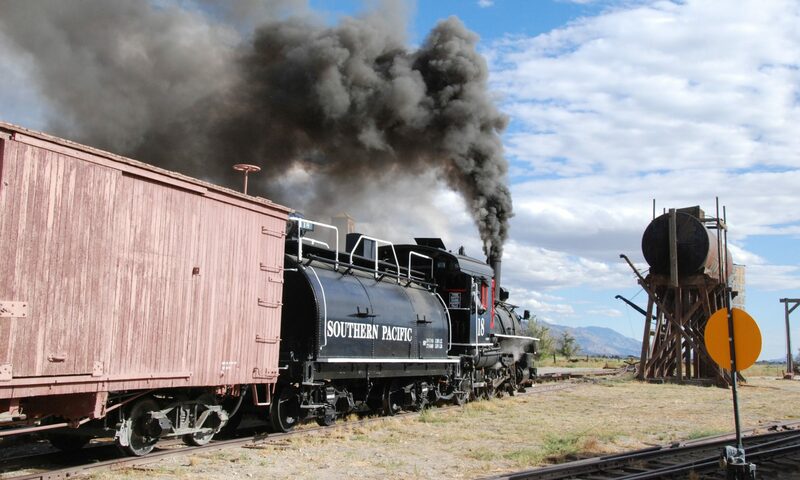 The question that must be answered: Is it in the best interest of Inyo County and the town of Independence to do something special with their steam locomotive? The answer should be yes, for the same reason we pass down heirlooms to our children and grandchildren. Not because of the object itself, but because the object tells the story of where we came from and who we are. This, after all, is the same reason why the #18 was preserved in 1955. A cold silent #18 is just an object we have to take care of occasionally. An operational #18 is bringing the past alive by making it present for the future. Report prepared by Randy Babcock. Assessment preformed by Bill Palmer, Randy Babcock and Mike Arciniega with assistance from Dave Mull, Betty Mull, Rich Cromer and Lynn Cromer of the Carson and Colorado Railway Society. Currently works for the San Diego Northern Railway in its Stuart Mesa service facility. Bill was the former chief maintenance officer of the Bell Gardens railroad in Valley Center, CA. Bill has also worked for the Union Pacific steam program during their extensive rebuild of engine 844, a very large steam engine that the railroad uses for publicity purposes. He also was one of the leads of the San Bernardino Railroad Historical Society’s rebuild of former Santa Fe engine number 3751. Additionally Bill has been hired to consult on various other steam locomotive restoration projects. Randy currently works as a machinist for the Durango and Silverton Railroad, where he helps maintain a roster of steam engines from the 1920s that make 90-mile round trips on steep grades seven days a week during the season. He is involved in all aspects of work in the railroad’s roundhouse, from daily servicing and minor repairs to complete engine overhauls. He recently was very involved in the Durango Railroad Historical Society’s rebuild of engine number 315. This project—which succeeded in rebuilding a locomotive in a city park and making it the star of steam-railroad events on two different railroads—was quite similar in size and scope to the #18 project. Previously Randy was one of the mechanics on the steam railroad at Knott’s Berry Farm. Randy has been involved with the CCRY for the past 13 years and was present during some of the early work on the #18 as well as the steam test in 2001. Randy has both led and been involved with other steam projects both public and private. Mike is currently a mechanic on the Ghost Town and Calico Railroad at Knott’s Berry Farm in Buena Park, CA, where he works on all aspects of the maintinance and operation of the park’s historic steam locomotives. Knott’ s has two locomotives of similar size to the #18 that are operated daily during the summer months. Additionally Mike has assisted on various other steam projects. 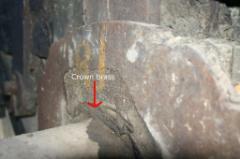 Crown Sheet: The layer of steel above the fire on the rear portion of the boiler. This would be equivalent to the bottom of a tea pot on a stove. Side Sheets: The steel sides of the boiler around the firebox. Tube or Flue Sheets: The front and rear sheets of steel that all of the tubes pass through. Tube or Flue: The pieces of pipe that run the length of the boiler between the tube sheets that carry the heat of the fire. Staybolts: (rigid or flexible) Staybolts are threaded bolts that run through the inner and outer sheets on a boiler around the firebox area. Rigid stays are solidly attached on both the outer and inner sheets that they go through. Flexible stays are not solidly attached on the outer sheet and are able to more freely expand and contract with the boiler. Flexible staybolt caps and sleeves: On the outer sheet of the boiler. The flexible staybolts terminate inside these caps and sleeves. Safety’s: The devices to relive excess steam pressure on the boiler. They are located on top of the locomotive on the steam dome. Dry Pipe: Pipe that carries the steam through the throttle in the steam dome to the cylinders on the front of the locomotive. Steam Dome: The rear dome on the top of the locomotive that contains the throttle. 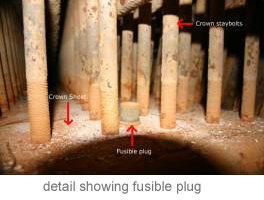 Fusible Plugs: Plugs on the crown sheet that are designed to blow out if the water level of the boiler gets too low. Firebox: The area of the locomotive that the fire is contained. It is surrounded by the crown sheet, side sheets and rear tube sheet. Smokebox: The area at the front of the locomotive with the smoke stack on top. All spent gasses and smoke are let out through this area. 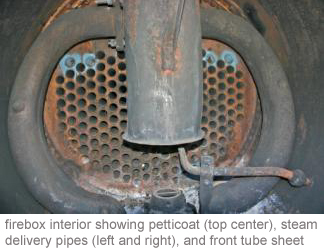 Petticoat: Located in the smokebox, it helps retain the heat in the tubes prior to allowing it to escape through the smoke stack. Lagging and Jacketing: The insulation around the boiler and the metal sheeting that holds it into place. Originally this was asbestos. Running Gear: The frame, wheels, side rods and all related components that make the engine move. 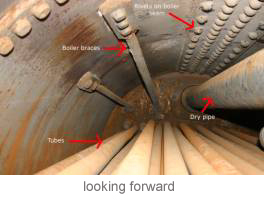 Grease or oil cellars: Located below the locomotives axles to provide lubrication to the journal surfaces. They can be either grease or oil. 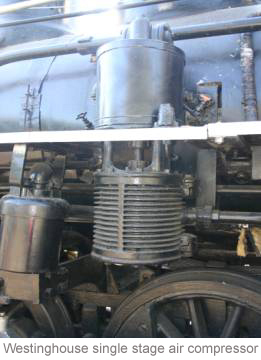 Crown Brasses: The brass bearing surfaces located above the main axles of the locomotive within the driver boxes. They are lubricated by means of grease cellars. Driver Boxes: The boxes that ride between the frame and main axles that contain crown brasses and grease cellars. 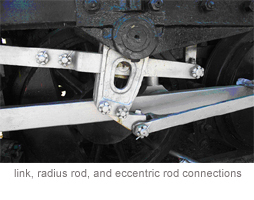 Tramming: Term referring to the aligning of the axles at 90 degrees to the frame. Pony truck: The four wheels in front of the main driving wheels that guide the locomotive but provide no propulsion. Valve Motion: The series of rods that allow steam into the cylinders at a certain time to allow movement of the engine. Controlled by means of the Johnson bar, located beside the engineer. Timing: Term referring to the setting and adjusting of the valve motion. Spring Rigging: The suspension of the locomotive including springs, and all related hangers and pins. 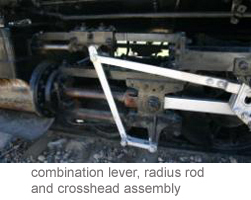 Crossheads: The means of connecting the side and main connecting rods to the pistons. It is the key in transmitting the steam from the cylinders to motion. Dynamo: A steam driven turbine generator to provide electricity. Air Compressor: A steam driven device that provides all air for the brake system of the locomotive and any train in tow. Hydrostatic Lubricator: The device that provides lubrication for the locomotives cylinders and the air compressors. It is controlled by the engineer in the cab. Injectors: Devices for putting water into the boiler against the steam pressure from the tender. The locomotive has two of them. 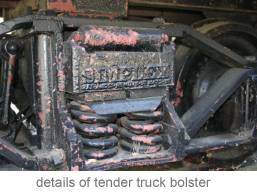 Bolsters: The cross members on the tender trucks and tender frame that provides the connection between the tender trucks and tender frame. Feed Valves: Used on the air system to regulate the air pressure.